Don’t miss the chance to take part in one of the most epic MONOPOLY games ever! From January to March 2019*, enjoy the life-size version of the world’s best-selling board game and win fabulous prizes on Genting Dream and World Dream, the megaships of Dream Cruises. In addition to family fun and games, treat yourself to a hassle-free celebration of Lunar New Year at sea with festive feasts and parties, educational STEAM workshops for kids and more! On every sailing during the promotion period, guests of Dream Cruises have the exclusive privilege to enrol in the tournament of world’s first-ever life-size MONOPOLY board game at sea, featuring a customized game board with property spaces that are named after signature outlets and amenities aboard the cruise ship, such as Crystal Life Spa, Little Dreamers Club and ESC Experience Lab. In addition to the grand prize, in every game, there are instant prizes such as onboard offers, discounts and special experiences up for grabs in Chance Cards and Community Chest cards. Winners of the tournament will automatically become eligible for the Ultimate MONOPOLY Family Game Challenge, where the champion will take home the Ultimate Grand Prize. Dream Cruises takes the MONOPOLY Board Game at Sea beyond the game board and fully integrates the game with every cruise journey – upon patronage of designated amount at onboard dining, service, retail and entertainment outlets, guests receive a MONOPOLY Title Deed Card. Simply collect a full set of Title Deed Cards in the same color category to redeem instant prizes like retail discounts and complimentary menu items! Guests are also encouraged to play with their food – namely with the limited-edition MONOPOLY tea set, in which iconic game tokens are transformed into delectable treats, all served on a MONOPOLY game board platter. MR. MONOPOLY, the iconic character of MONOPOLY board game, will dress up especially for the occasion and greet guests during tea time in his tailor-made captain uniform. MR. MONOPOLY will also don the role of the God of Fortune on designated sailings, where he will join the Chinse New Year parade and distribute golden chocolate coins to wish everyone a prosperous year of the pig; he will also make guest appearances at entertainment shows, including the two brand-new stage productions – FAITH and Dulce Habana on World Dream, as well as SONIO – ‘A Tale of Two Dreams’ and Some Like It Hot, both of which are recently launched on Genting Dream. Children can make the most of their winter holiday at sea with the STEAM edition of Dream Cruises’ signature Little Dreamers Program, which is designed exclusively for kids aged 2-12 years old. In collaboration with Silicon Workshop Limited, EVI Services Limited and Lego Education, a series of STEAM workshops and games will be hosted aboard, through which kids will gain new knowledge in Science, Technology, Engineering, the Arts and Mathematics while being creative and having fun. 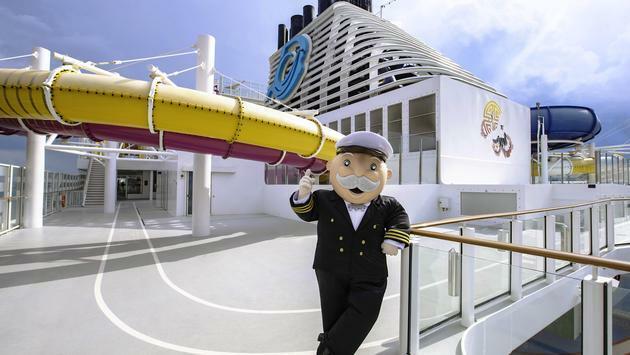 Little Dreamers will also be trained to become “Junior Dream Makers” – a unique experience where the kids will have access behind the scenes of various work posts on the ship and gain first-hand knowledge from the experts in marine operations, housekeeping, entertainment and more. Little Dreamers who successfully complete all classes in the program receive a commemorative certificate and a special gift at the graduation ceremony. Get into the festive spirit with a big family feast, complete with the traditional trimmings – poached dumplings for prosperity; abalone, shitake mushrooms and black moss for wealth; steamed fish for abundance and sweet glutinous balls for a family reunion, all served piping hot and free of charge at inclusive restaurants* on-board. Catch multiple festive happenings on the cruise, such as the Chinese New Year parade and fireworks#, lion and dragon dance, traditional handicraft workshop and more.